A group of veterans spent the morning at the Southern Illinois University Edwardsville East St. Louis Center (ESLC) learning about a host of educational opportunities available to them, how to obtain those benefits and how to best navigate their way to success. ESLC’s Veterans Upward Bound (VUB) program presented a Free Application for Federal Student Aid (FAFSA®) and Veterans Educational Benefits Workshop on Tuesday, Feb. 5. The VUB program has a comprehensive pre-college program and currently serves 110 veterans, according to Robbins, an Air Force veteran, who served in Vietnam. Veterans Upward Bound assists with the pursuit of vocational/technical, associate’s and bachelor’s degrees. Our mission is to provide supportive services to military veterans, and members of the National Guard and Reserve to enable them to enter or re-enter a vocational/technical school or a two- or four-year college. We are looking for veterans who want to further their education, but need help navigating the enrollment process and finding financial assistance. We are looking for veterans who need help in balancing work and family. We are looking for veterans who are ready to take on the task of making life better for themselves and their families. 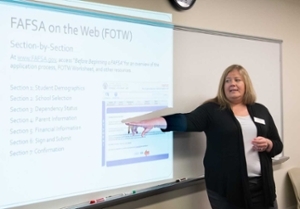 Katie Eilers, assistant director of Client Services in the SIUE Office of Financial Aid, talks to veterans about Free Application for Federal Student Aid (FAFSA®) benefits. 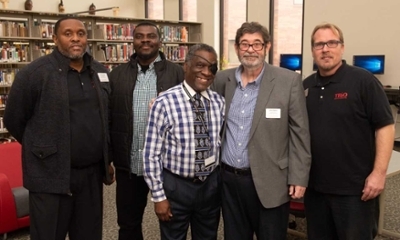 Shown from L-R are Carlton McGee, VUB counselor/ tutor; Kome Udjoh, VUB graduate assistant; McKinley Hubbard, St. Louis Vet Center counselor; Jim Robbins, VUB program director; and Jeremy Bailey, VUB program coordinator.